When it comes to rental car services, there aren’t many names as big as Hertz and when it comes to high performance rental cars, no one has a greater legacy of putting powerful cars in the hands of people who cant afford to buy one like Hertz. The company started the “rent-a-racer” program back in the 1960s and today, Hertz has one of the most elaborate lineups of high performance rental cars. In 2018, Hertz is celebrating their 100th birthday and they are doing so by offering a special edition Corvette. 100 examples of the Hertz 100th Anniversary Edition Corvette Z06 is headed to rental fleets at select airports around the country, bringing access to the LT4-powered Chevy to the masses. In 1918, a man named Walter Jacobs started a rental company in Chicago with a modest fleet of Ford Model Ts and in 1923, Yellow Cab Company founder John Hertz purchased Jacobs’ company, changing the name to Hertz. Over the years, Hertz grew to be one of the largest rental car companies in the USA and when they introduced their rent-a-racer program in the 1960s, the company earned the admiration of the performance car world. Today, Hertz has locations at pretty much every corner of the country and the company continues to offer high performance rental cars, although the modern high performance rentals are monitored far better to make sure that people aren’t replacing performance engines with less powerful versions. 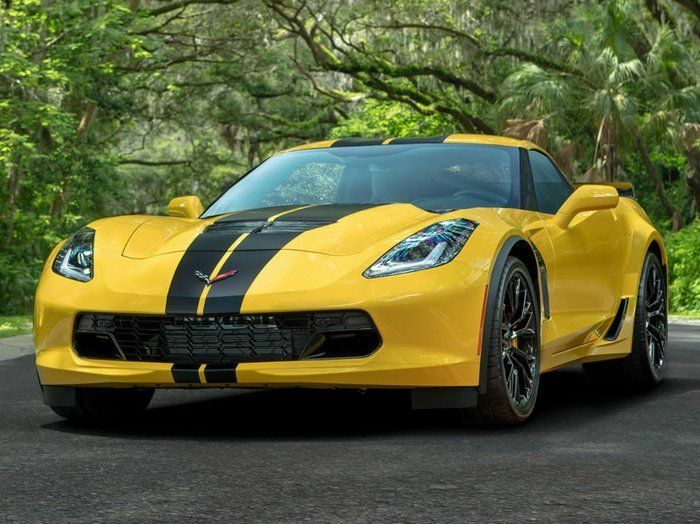 The newest high performance Hertz rental car being added to the fleet is a Chevrolet Corvette Z06 that has been specially built to celebrate 100 years of Hertz rental cars. The 100 unique examples of the Hertz 100th Anniversary Edition Corvette Z06 are powered by the same 650-horsepower LT4 that motivates the rest of the modern Z06 models, with an 8-speed automatic sending the power to the rear wheels. All of these cars are bright yellow with black stripes and Hertz badging on the outside while the inside gets more unique badging with a personalized Hertz centennial anniversary plaque that displays the model number of the vehicle out of 100. These cars are available for rental at airport locations in the following cities: Atlanta, Boston, Chicago, Dallas, Fort Lauderdale, Fort Myers, Las Vegas, Los Angeles, Miami, New York, Orlando, San Diego, San Francisco and Tampa. You can reserve time with one of these cars on the Hertz website and the price starts at $199 per day including 75 miles of driving range, but with fees, the actual price is closer to $275. Once these cars are done with rental duty, they will be transferred to the Hertz Car Sales branch of the company, meaning that you will be able to buy one of these cars within a year or so.